On Sunday, September 18th, 2016, New York/New Jersey Kyudo Kai did a kyudo demonstration at Japanese American Association of New York. The demonstration was follwed by instructional activities. The demonstration is part of the program to celebrate "The 10th Annual Senior Month 9/08 -10/09, 2016". Japanese American Association of New York website http://jaany.org/. Japan Fair was in Catskills on August 13th. 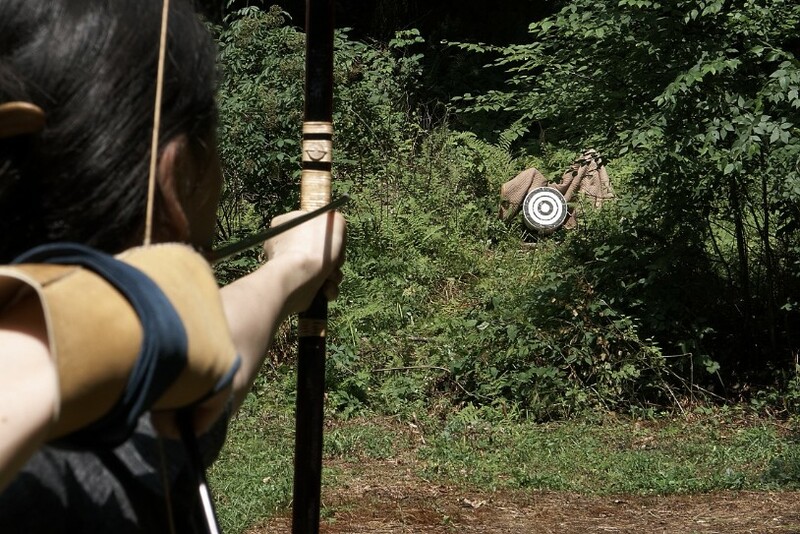 New York / New Jersey Kyudo Kai demonstrated what Kyudo is to the general audience. Detailed information can be found on the Japan Fair website. It was an incredible and blazing hot week in Northfield, Minnesota. Over a hundred people from all over the United States and other countries participated in this year’s IKYF American seminar. For many of us, it was a heartwarming reunion. There were also a lot new faces but we all quickly introduced each other and got along. Together, we walked down from our dorms to the dojo in our hakama uniforms, a yumi bow in one hand and case of arrows in the other. I’m sure the other people that stayed in the same campus as us were very curious as to what we were practicing. 2016 IKYF American Seminar was hosted by the Minnesota Kyudo Renmei on July 18-20th. They prepared a large, beautiful space for practice, comfortable dorms, and access to a dining hall with delicious foods! 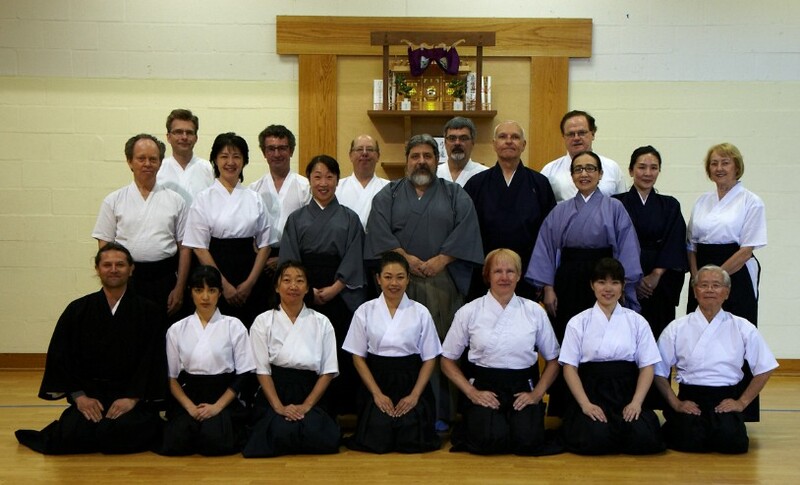 We were absolutely honored to have three highly experienced Hanshi instructors to lead us. Chief Instructor Hayashi Fumio, Instructor Kubota Kiyoshi, Instructor Ogura Masaki, traveled all the way from Japan to lecture and judge us for the Shinsa that was held on July 21st. After the opening ceremony, the seminar began with everyone being split in three groups to practice on one of the Shajos. 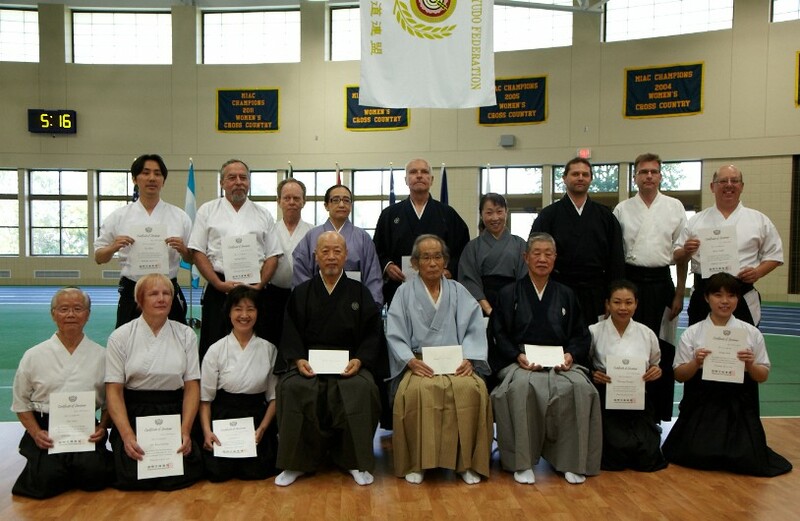 Chief Instructor Hayashi Fumio led the high ranking group. Instructor Kubota Kiyoshi led Ni-dan and San-dan. Mudan and Shodan group was led by Instructor Ogura Masaki. We all stepped onto our assigned Shajo spaces to perform Taihai as the instructor closely observed each and every one of us. They pointed out and fixed all the details. With the help of our translators that made sure everyone was able to communicate with each other, the Hanshi Instructors proceeded with a critique of their group’s overall performance. For the people in Mudan/Shodan, Ogura Sensei broke down everything we needed to work on. “Zenbu (Everything).” he said at the end. We needed to fix everything. We all started laughing out of pure humbleness and slight nervousness. We felt that it was a going to be a very intensive seminar for the next few days. And so, following our Kyudo packed schedule from 9:30 to 5:30, each day the instructors gave their lectures passionately. They continued to observe and critique as we practiced and vigorously took down notes. Three days of in-depth instruction was both physically and mentally exhausting, however, we were healed by the occasional bursts of laughter coming from each Shajo. We were all having a great time! The Taihai competition and open practice further prepared us for the big day, Shinsa Day. seminar and applying to their performance. It is not easy to perform, there is always so much to learn and overcome. And with the help of our teachers, peers, friends, and family, this process of learning and overcoming in Kyudo is always rewarding. Every seminar, we are reminded that we all gather for the same passion. It is something to always look forward to no matter the outcome. We are very excited for the next event and hope to see everyone again! As in the previous years, the seminar started on Saturday morning in Alexandria dojo, in downtown Alexandria, VA. Instructor Dan DeProspero Renshi, 6th dan, opened the seminar on June 18th at 10am. After everyone finished shooting, all of us received general comments on the performance. Then we started second round. After the brake for lunch we resumed shooting with more detailed instructions from Dan DeProspero sensei with help from Bill Reid sensei and Fumiko Takada sensei. Later we practiced, how to deal with mistakes (shitsu). The first day of the seminar was concluded with closing ceremony at 5:30pm. Many of the participants went to the traditional dinner at Sumo restaurant. On Sunday we moved to King George, VA, to practice in Bill’s sensei backyard. As the weather allowed us we stayed outdoor practicing until 1pm. On the second day of the seminar we received more detailed and personal instructions. After delightful lunch everyone started their trip home. After two days everyone was well prepared for the upcoming IKYF American Seminar and shinsa in Minnesota. Thank you all, and hope to see you again in the near future.